Based on the pattern of BPSC Mains Exam. Questions exclusively related to Bihar. Extensive coverage of entire General Study syllabus. Timely evaluation within a week. Proper feedback to each candidate according to performance. Test Series Only Available in Offline Mode. Note: Test Series Available in Mukherjee Nagar and Old Rajendra Nagar Delhi, Center Only. 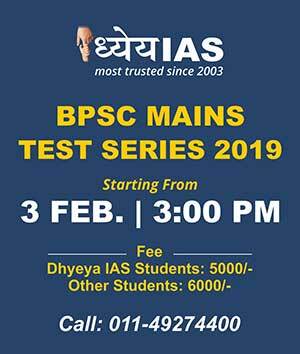 You can purchase Test Series From DHYEYA IAS Mukherjee Nagar Delhi Center.